In the United States, where the majority of the population uses the internet, age may influence whether an individual relies more on their smartphone or uses cable broadband services to browse the web at home. Millennials are more likely to ditch broadband and just use their smartphones at home, while older generations prefer a broadband connection. That analysis comes from ReportLinker Insight, which surveyed 500 individuals who were connected to the internet at home, in an effort to better understand American browsing habits and how new mobile technologies have impacted their internet usage. Research from the U.S. Census Bureau indicates that the move to mobile internet is accelerating: Mobile-only use has doubled in just a few short years, from 10 percent in 2013 to 20 percent in 2015. 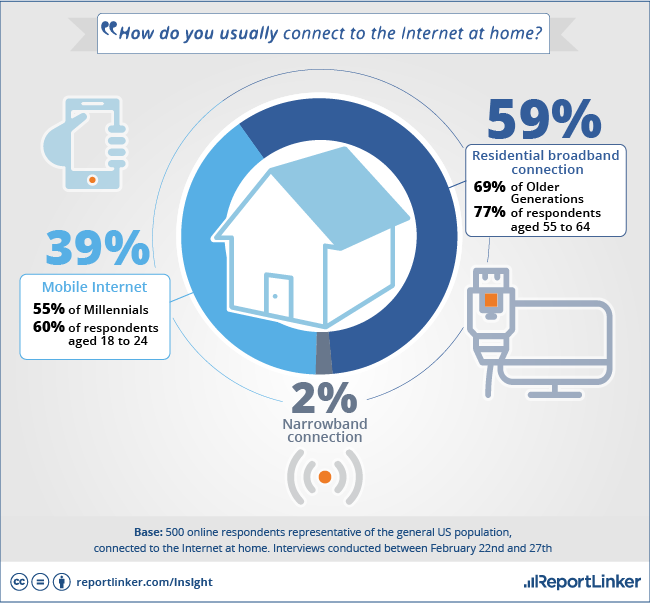 ReportLinker expects this trend to accelerate, with 55 percent of the millennial generation (respondents ages 18 to 24) using their smartphones to connect to the internet at home, according to its survey. Meanwhile, 69 percent of older respondents (ages 55 to 64) prefer a broadband connection. Home broadband is not reliable (8 percent). Not everyone in their household has a good data plan for their smartphone (5 percent). One in five broadband users were convinced by a package deal that combined TV, internet and home phone. Furthermore, young Americans’ mobile-only habits may drive growth in the smartphone market, which has been forecast to make a comeback in 2017. They have already captured the attention of major carriers, who are rolling out unlimited data plans to attract more customers. For instance, ReportLinker noted, Verizon finally caved this past February and brought back its own unlimited plan. To view all of the survey findings, visit the ReportLinker site.